Umberto Eco’s final novel is a fast-paced historical thriller centred on a newspaper that will never be published, and a conspiracy theory surrounding the death of the Italian dictator Benito Mussolini. 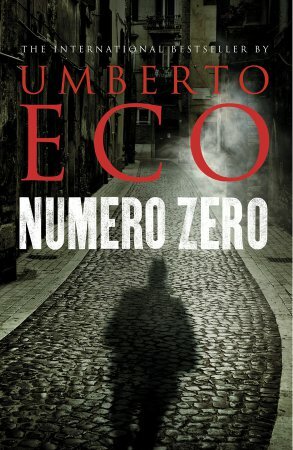 At just under 200 pages, Numero Zero is the shortest of Eco’s novels by a considerable margin. As such, it is perhaps one of his most accessible books and something that I was able to enjoy in one sitting. Colonna, an over-the-hill writer and journalist, and a self-confessed loser, is offered the opportunity to ghostwrite a memoir for the newspaper editor, Simei. Simei is setting up a new paper, Domani (Tomorrow), which is to be financed by a powerful media magnate. The title of the book refers to the dummy issues of the newspaper that they will be producing to showcase their work as a new kind of newspaper; one that will report not what has happened, but what will happen tomorrow. The memoir that Simei wants Colonna to write would tell the story of a newspaper of great integrity getting shut down due to pressures from a corrupt society. Simei suspects that the newspaper is actually being used as a means for the financier to gain access into the higher echelons of the finance and business worlds he aspires to and will be closed when he has reached his goal. Both the memoir and the newspaper itself, then, are fictions, manufactured with ulterior motives in mind. The conspiracy being played out behind the scenes of this newspaper crosses over to the conspiracy that the journalist Braggadocio believes he has uncovered in relation to the death of Mussolini; a conspiracy which has, according to Braggadocio, guided the course of Italian history since the end of World War II. While Eco is well known for his complex plots, the length of Numero Zero perhaps isn’t as conducive to the layered conspiracies at work in The Name of the Rose or Foucault’s Pendulum, but the weaving through of history, conspiracy, and the kind of self-fulfilling or self-created conspiracy familiar to Eco readers, still makes for an interesting entanglement. The novel is written entirely in the first person and is structured so that in the opening passage, written in the present tense, the narrator, Colonna comes across as completely paranoid. He is in his house, obsessing over the fact that his water has been switched off during the night. He surmises that an intruder, worried that the dripping tap would wake Colonna and alert him to their presence, turned off the water to search the house in silence. The narrative then shifts to the past tense, where Colonna relates the story of his time at the newspaper and the conspiracy theory that Braggadocio relates to him. As the narrative builds, Colonna’s state of mind at the novel’s opening seems to gain a level of grounding, though, of course, nothing is certain. The narrative shifts back to the present tense for its conclusion. My only criticism of this novel is that it relies heavily on dialogue for exposition, which can become tiresome. The Mussolini conspiracy is related entirely through conversations between Braggadocio and Colonna, and even though the story comes out in pieces over time, it doesn’t always carry the suspense that you would hope for. That said, the conspiracy itself is well constructed, and, as one might expect with Eco, it is woven masterfully through the history of Italy. This book is packed with irony, and witty, satirical remarks, particularly relating to writing, journalism, and even book reviewers who don’t actually read the books that they review–not the case here, I assure you! It is also dense with intertextuality and allusions to other texts from the literary canon to the realms of popular culture; from a corruption of E.M.Forster’s ‘only connect’: ‘Suspect, always suspect, that’s the only way to get to the truth’, to mentions of James Bond and Inspector Maigret. The biggest victim of Umberto Eco’s satire in Numero Zero is the media. The newspaper staff at Domani display stereotypically sexist attitudes, look down on and seek to manipulate their readership, and make a mockery of the idea of journalistic integrity. Eco’s portrayal of the sexism at work in the media is an excellent rebuttal for a writer that has been accused of a kind of literary sexism in writing very one-dimensional female characters, where they are written at all. While the only female character in this, Maia Fressia, isn’t the best drawn female character in literature, and may tend towards being a fairly stereotypical representation–a female journalist limited to celebrity romance stories who wants to break into serious journalism–the representation of her situation at the newspaper really does show strong narrative sympathy for her, while showing up the patriarchal world-view as one built on a level of misunderstanding, which itself is openly mocked. The editor, Simei, consistently refers to Maia as ‘my dear’ and says things like, ‘Don’t you worry, just go back to your horoscopes.’ Her ideas, thoughts, and humour, are continually dismissed, and she is openly sexualised by Braggadocio, who diagnoses her with autism for thinking about things long after the discussion is over. Even Colonna, who recognises her ability, engages in thinking and behaviour that betrays a sexist outlook: ‘At that point I had to explain to her what her problem was’. The narrative mocks these attitudes while presenting Maia as an intelligent, capable, stable force in the novel. For what transpired to be his last novel, Numero Zero is sadly not a triumphant return to the form of his earlier works, but it is an enjoyable book, and an easier read, with plenty to think about long after the final page.